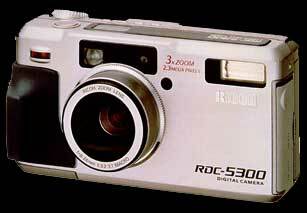 Ricoh today announced (officially.. this news has been knocking around for a few weeks) the 2.3 megapixel, 3x zoom, RDC-5300. Interesting features include USB, bracketing (multiple shots at -0.5EV, normal and +0.5EV). And only $699. Ricoh PC Peripherals Business Unit today announced that its new 2.3 megapixel digital camera, the RDC-5300, will be available in late October. The affordable RDC-5300 is designed for a wide range of use, offering a very powerful feature set that is expected to appeal strongly to business and consumer photographers. The USB-enabled camera includes 8MB of onboard memory and offers the ability to utilize smart media cards of up to 64MB. The RDC-5300 offers an internal flash, as well as the ability to attach an external flash unit to control the exact lighting conditions for each shot. At $699, the camera is equipped with both a 1.8-inch full-color LCD panel and an optical viewfinder to permit perfect image composition under a variety of conditions. It also has a 3x continuous optical zoom augmented by a 2.5x digital zoom. A full digital zoom, used alone, results in a perfect 640 x 480 pixel image that is ideal for Web publication. The optical system's 2.3 million pixel resolution provides either 1792 x 1200 pixels for a perfect high-resolution 8-x-10 inch photo print or 896 x 600 pixels, for smaller photo reproductions or for use as higher resolution PC background images. The optical zoom lens also can provide the equivalent of wide, normal and telephoto capabilities. The lens system provides an autofocus Super Macro feature to enlarge an image frame by up to 69%, for enhanced close-up images of small objects. The built-in time lapse mode captures images at intervals settable from 30 seconds up to three hours, so the camera can capture slow-motion or interval sequences of anything from a flower opening to a sunrise or sunset. Once captured, images are stored in industry-standard JPEG format, with a choice of three compression levels - fine, normal or economy - to accommodate different needs for detail or storage capacity. USB (Universal Serial Bus) compatibility allows fast image transfer (more than 10x faster than standard serial throughput) to a PC, printer, CD writer or other external image-handling device, though a standard serial port is also provided for compatibility with non-USB systems. When connected by USB, the camera mimics a hard disk drive, letting users drag and drop images from the camera directly to any PC that runs either Windows 98 or Macintosh OS 8.5 or higher. Other RDC-5300 unique features include automatic sequential image numbering, automatic date imprinting, selective image password security, and memory buffering to permit rapid sequential shooting at intervals of less than two seconds. While many of the camera's image-capturing features are automated to make the results nearly mistake-free for casual or inexperienced users, features like auto focus, auto exposure, auto flash, auto white balance control and auto red eye reduction can be overridden at need by more experienced users. In addition, turning off auto flash in good light extends battery life. As an added bonus, photographers may also select black-and-white or sepia tones rather than full color when desired. For truly fine image control, the auto-bracketing feature can capture a default or a manual compensated setting, plus a second image at +0.5 EV and a third at -0.5 EV, allowing the photographer to select for subtle differences. ArcSoft PhotoStudio 3.0 for image editing, PhotoBase for photo album organization, PhotoMontage for creating digital collages, PhotoFantasy for items with creative backgrounds while using digital images, PhotoPrinter for laying-out images in multiple sizes on single sheets of paper, and PhotoIsland for building virtual photo albums on the Internet. The Ricoh RDC-5300 digital camera will be available through a nationwide network of Ricoh certified resellers for an estimated street price of $699. Customers can receive live technical support seven days a week, or via faxback 24 hours a day, by calling Ricoh Technical Support at (888) 742-6410. Technical support is also available through the Web site support at www.ricohcpg.com, or via e-mail at tech_support@ricohcpg.com.